Even in places that are typically dry and void of a lot of color, you can sometimes find floral abundance of the most glorious kind if you look hard enough. This is what’s possible for those who live in, or who visit, Albuquerque, New Mexico. The city is home to an organic lavender farm that provides healing and aromatic oils, by way of organic lavender blossoms grown on land that also houses a historic inn. Guests staying at the Los Poblanos Historic Inn & Farm get to use the lavender oil-infused bath products as part of their stay. Los Poblanos Historic Inn & Farm in Albuquerque, New Mexico runs an Organic Lavender Farm that provides lavender oil for a line of artisan skincare products made available in the Inn’s guest rooms. The lavender for the oil is grown with the environment and guests’ health in mind, and it’s been produced that way for years. 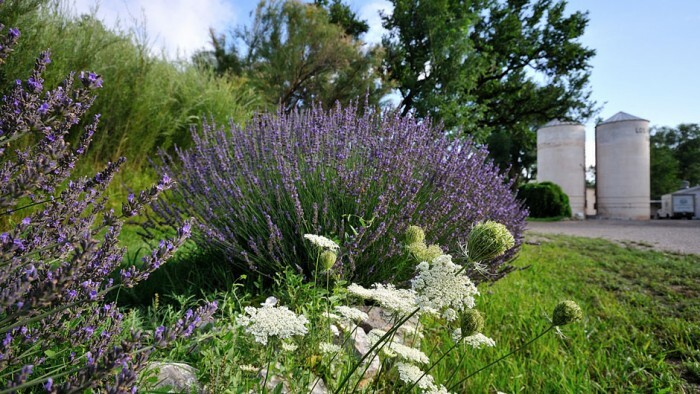 When travelers stay at Los Poblanos Historic Inn & Farm, they’re able to see first hand how organic lavender is sown and harvested – without the need for harmful chemicals that wreak havoc on the health of the soil, wildlife, or humans. They’re able to experience organic agriculture for themselves, and they can participate in a rich history of growing plants in a way that respects the earth. The lavender at Los Poblanos Historic Inn & Farm is grown according to the highest water conservation and soil structure ideals, then it’s gently harvested and steam distilled at the farm, to extract the potent oil in a pure and pristine way. Albuquerque’s natural resources and climate benefits are the focus throughout the lavender’s growing process. Using what the earth naturally provides for the area, and working the land responsibly, helps farmers grow plants that are stronger, require less work to maintain, and are more pleasurable for all who enjoy the fragrant oils that come from them. To find out more about how you can visit Los Poblanos Historic Inn & Farm, and experience the healing nature of the Inn’s lovely lavender oil-infused products, visit the Los Poblanos Historic Inn & Farm website. Even in places that are typically dry and void of a lot of color, you can sometimes find floral abundance of the most glorious kind if you look hard enough. This is what’s possible for those who live in, or who visit, Albuquerque, New Mexico. The city is home to an organic lavender farm that provides healing and aromatic oils, by way of organic lavender blossoms grown on land that also houses a historic inn. Guests staying at the Los Poblanos Historic Inn & Farm get to use the lavender oil-infused bath products as part of their stay. Even in places that are typically dry and void of a lot of color, you can sometimes find floral abundance of the most glorious kind if you look hard enough. This is what’s possible for those who live in, or who visit, Albuquerque, New Mexico.The city is home to an organic lavender farm that provides healing and aromatic oils, by way of organic lavender blossoms grown on land that also houses a historic inn. Guests staying at the Los Poblanos Historic Inn & Farm get to use the lavender oil-infused bath products as part of their stay.